Whether you're working in the garden, or just out-and-about town on a rainy day, you'll be comfortable, dry and secure in your Black and White Polka Dot Shoes. You'll love the slip-on convenience and comfort, the ease of cleaning and secure traction, but most of all, you'll love all of the compliments coming your way! Just like the rest of our Sloggers made in the USA shoes, they feature "All-Day-Comfort" insoles, Sloggers' signature deep lug sole for great traction in wet and muddy conditions, and a soft binding around the top. 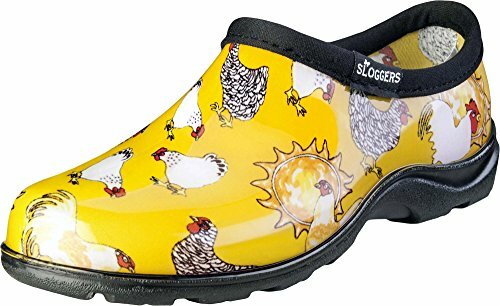 Sloggers shoes are made from 100% recyclable, medical grade material so they have a soft feel, produce no odor, are easy to hose off clean, and will last for years. The sole contains up to 50% recycled material so when your finished with your shoes, you can send them back to Sloggers and they'll turn them back into a new pair! How's that for "reuse and recycle"?